We are so happy you will join us on April 14, 2018 with us in beautiful Salem, Oregon! Below you will find plenty of information to sort through. This will help you plan and prepare for your day with us, happening 11am-2pm. Please be mindful of our impact. Carpool, bike, or walk to join us. Bring your reusable water bottle to stay hydrated during the event, we will have coolers for refills. Pack it in, pack it out- please, let’s leave a good impression on Salem and not leave trash, March signs, or other debris in the area. Reduce your trash consumption, reuse your sign by putting it in a window at home or work, and recycle what you can! If you’d like to help the cleanup effort, please feel free to join us afterwards to tidy up. An extra reason to carpool is that parking can become tricky. We are expecting a large crowd and there are other events happening in the area, so please allow time to find a spot to park, and check google for possible parking garages in the area. IkeBox and the YMCA have generously offered use of their restroom facilities for our attendees. Thank you! Restrooms are also available in the park. There are three parts to our event: local organizations at exhibitor info booths, a speaker rally, and the march. 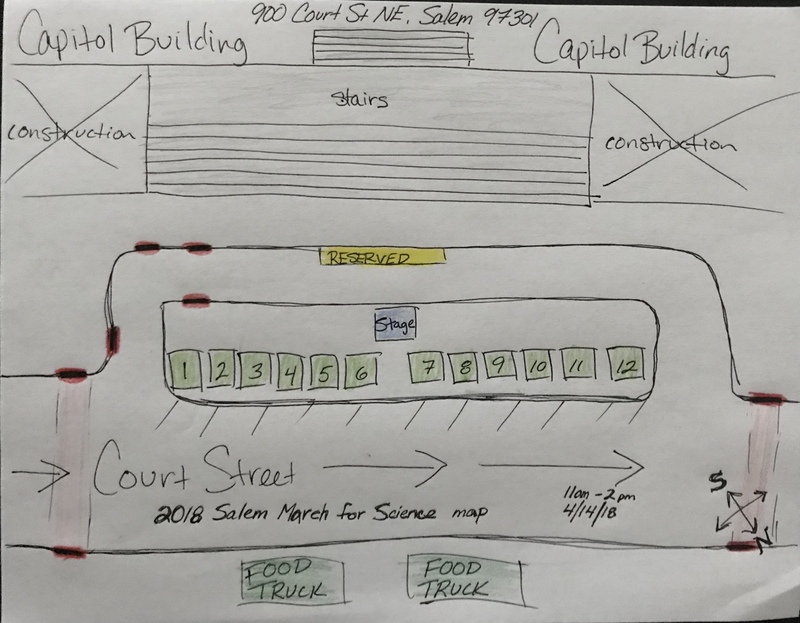 Booths, the rally, and the beginning and end of the march route are all the same place: The Oregon State Capitol Building, 900 Court St NE, Salem, OR 97301. There will also be food options available. There will be a reserved area in front of our speakers for marchers that have a wheelchair, or need a chair to sit for the rally. There will be ASL interpreters for the speaker rally. Please see red dashes on the rally map for accessible sidewalk areas. Our local exhibiting organizations will be available to connect with the community beginning at 11am in a number of booths. 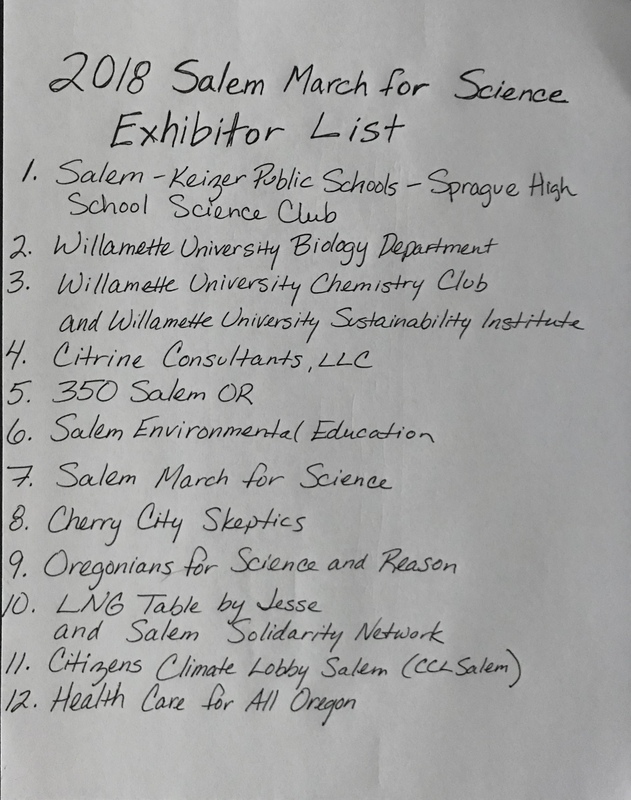 Community exhibitors include Salem, Oregon March for Science, 350 Salem OR, Cherry City Skeptics, Salem Environmental Education, Salem Solidarity Network, Citrine Consultants LLC, LNG table by Jesse, Willamette University Sustainability Institute, Oregonians For Science And Reason, Citizens Climate Lobby, Willamette University Chemistry Club, Sprague High School Science Club, Willamette University Biology Department, and Health Care for All Oregon. We encourage you to visit them to find ways you can stay engaged. Register to vote, write your reps letters, learn how to get involved with local organizations, participate in hands on experiments, and more. Exhibitors will remain available until the march begins, and we hope this wide window of time allows you all to makes these connections. Make connections, stay engaged, fight for science. Our speaker rally will begin at 12pm. Attendees will hear from Geovanni Tolentino, who will be speaking on science education and how imbalances hold us all back, Dirk Dunning, who will speak about climate change and the immediate need for stronger action, Emerald Stacy, who will speak about science research and the roles of women and marginalized groups within it, Jesse, who will speak on climate change and the Jordan Cove Pipeline, and Carolyn Parsons, who will speak on science research and agricultural impacts. In addition to these speakers, local high school student Rocco Jones will perform a rap about climate change. Following our speakers, our volunteers will give some reminders for our march and we will be on our way at 1pm. We do not have a road closure permit for the march, so will need to be aware of crosswalk signals along the route so as to not interrupt downtown. Volunteers will be stationed at crosswalks to help. We will cross Court St north from the Capitol building and head west down it. Volunteers and police will help lead this initial road crossing. There is not a traffic light crosswalk here, only two pedestrian crosswalks, though they do have flashing yellow lights for cars to see. Please watch and listen to our volunteers and police for instructions on managing our large crowd across an active roadway. 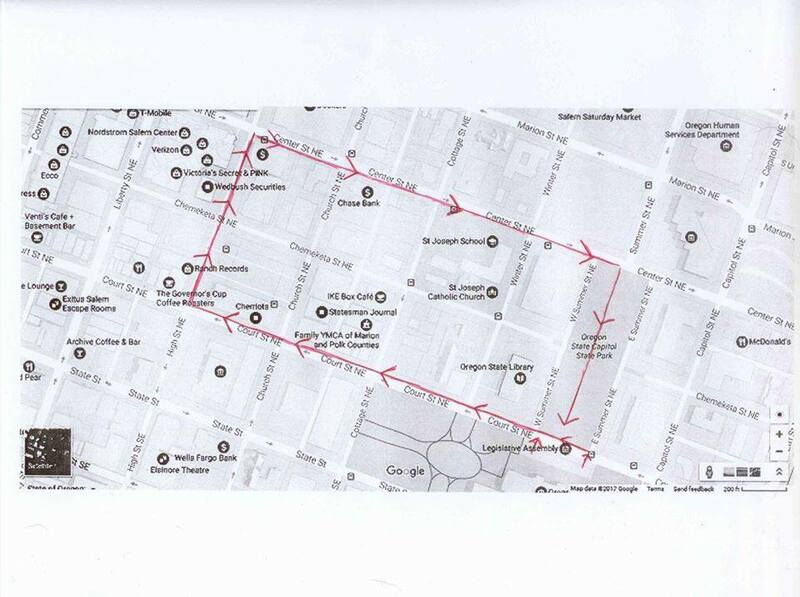 From Court St we will head north on High St and then take a right on Center St to head back east. We will cross the State Capitol State Park to return to the Capitol Building. Below you will find maps for the rally and March route. We are so excited the big day is nearly here! Please join us. Bring your friends, family, and neighbors. Bring your signs, energy, and enthusiasm. Science need us! 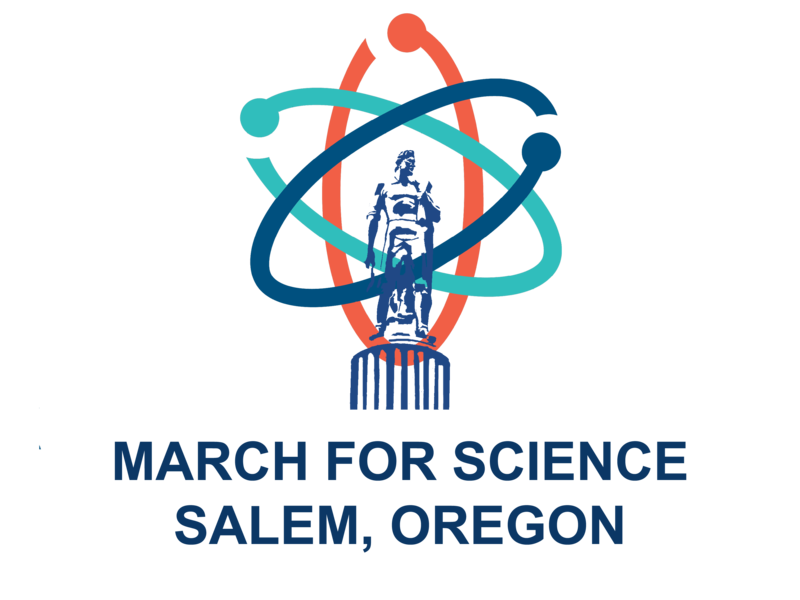 Please RSVP at marchforscience.com/RSVP and let your representatives know you'll be joining us on April 14!